...to our website that is dedicated to one of my favorite hobbies, Dutch oven cooking. 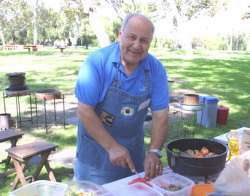 Since I started with Dutch oven cooking I have shared food, friends and fun. As a result, I have come up with a line of accessories to make your cooking easier and more fun. Enjoy these pages and let me know what you think on the "Contact Us" page. I remember cooking throughout my long journey in life from when I was 12 years old and my dad put me in a Boy Scout troop because he found that I had a love for outdoor adventure. In Scouting I learned how to cook and as I remember we used to cook our meals in camp on a wood fire with 2 stones and aluminum pots. I earned the Raider award (like Eagle Scout here) and Wood Badge and I became Assistant Scoutmaster and Scoutmaster and I founded two troops and a pack. Where I grew up in Lebanon I used to watch cowboy movies and I saw how they cooked with the Dutch oven and how they cooked beans on a wood fire and hanged the Dutch oven on a tripod. In 1985 due to the war in Lebanon, I immigrated to the United States with my family. When my son turned 11 years old I founded another Troop here with some men from our church, Troop 148 in Reseda, CA. At that time I took my two assistants and we went to the Wood Badge course in 1994 where I saw for the first time the Dutch oven and I cooked in it and I brought the black pot back to our Troop. I started using the Dutch oven for my family camping trips, and I loved it and became more interested, not only in the oven, but with all kinds of skillets that are made from cast iron. I remember how I took my family on a camping trip and cooked for them, BBQ pork chops and left the oven outside at night with some left over. In the morning my kids woke up early and went outside and saw the leftovers. They started asking me to come out to see the pot which was rusty. I started laughing and I told them it was OK. I forget to season the Dutch oven. Luckily nothing happened and we had a great meal. At home I replaced all our Teflon and other kinds of pots with cast iron and I have a good collection now of over 15 Dutch ovens for stove and charcoal use and over 40 skillets and casseroles of different shapes and sizes. My recipes, that I made to fit the Dutch oven cooking, were taken from our Lebanese food that I learned from my mom (she was a very good cook, and in the desert too!). I hope that you enjoy these recipes in your outdoor cooking or in your conventional oven at home. Since I work with iron, I made all my own cooking gear and created the foldable portable stand with the metal oil pan. I used to take it in my tent trailer for my family campouts and I donated a lot of them to my Scout council district and Wood Badge courses. A Dutch oven is a thick-walled iron (usually cast iron) cooking pot with a tight-fitting lid. It is commonly referred to as a 'camp oven' in the Australian bush, cocotte in French, as a 'casserole dish' in British English, and is similar to both the Japanese tetsunabe and the Sac, a traditional Balkan cast-iron oven. During the late 1600s the Dutch system of producing these cast metal cooking vessels was more advanced than the English system. The Dutch used dry sand to make their molds, giving their pots a smoother surface. Consequently, metal cooking vessels produced in the Netherlands were imported into Britain. In 1704, an Englishman named Abraham Darby decided to go to the Netherlands to observe the Dutch system for making these cooking vessels. Four years later, back in England, Darby patented a casting procedure similar to the Dutch process and began to produce cast metal cooking vessels for Britain and her new American Colonies. It is possible that because Darby's patent was based upon his research into the Dutch foundry system that the cooking vessels he produced came to be referred to as "Dutch" ovens. Other researchers believe that this term may have come from the itinerant Dutch traders who sold cooking vessels out of their wagons as they traveled from town to town and door to door. Maybe both accounts are true. In any event, the term "Dutch oven" has endured for over 300 years. Over time the Dutch oven used in the American Colonies began to change. The pot became shallower and legs were added to hold the oven above the coals. A flange was added to the lid to keep the coals on the lid and out of the food. The cast-iron cookware was loved by colonists and settlers because of its versatility and durability. It could be used for boiling, baking, stews, frying, roasting, and just about any other use. The ovens were so valuable that wills in the 18th and 19th centuries frequently spelled out the desired inheritor of the cast iron cookware. For example, Mary Washington (mother of President George Washington) specified in her will, dated 20 May 1788, that one-half of her "iron kitchen furniture" should go to her grandson, Fielding Lewis, and the other half to Betty Carter, a granddaughter. Several Dutch ovens were among Mary's "iron kitchen furniture". When the young American country began to spread westward across the North American continent, so did the Dutch oven. A Dutch oven was among the gear Lewis and Clark carried when they explored the great American Northwest in 1804-1806. The pioneers who settled the American West also took along their Dutch ovens. In fact, a statue raised to honor the Mormon handcart companies who entered Utah's Salt Lake Valley in the 1850s proudly displays a Dutch oven hanging from the front of the handcart. The Dutch oven is also the official state cooking pot of Utah. Mountain men exploring the great American frontier used Dutch ovens into the late 1800s. Dutch oven cooking was also prominent among those who took part in the western cattle drives that lasted from the mid-1800s into the early 1900s. A camping, cowboy, or chuckwagon Dutch oven has three legs, a wire bail handle, and a slightly convex, rimmed lid so that coals from the cooking fire can be placed on top as well as below. This provides more uniform internal heat and lets the inside act as an oven. These ovens are typically made of bare cast iron, although some are aluminum. A cast-iron Wagner dutch oven (on a trivet) and an enameled "French" oven by Le CreusetModern Dutch ovens designed for use on the cooktop or in the oven are typically smooth-bottomed. Some older styles, such as the unglazed ovens by Lodge, CampChef, and Wagner, retain the bale handle, while others, such as the enameled versions by Staub, Sante, and le Creuset, have two loop handles. Modern ovens may also be made of thick cast aluminum or ceramic. Le Creuset, a famous maker of enameled Dutch ovens, refers to their ovens as "French ovens", or in the UK as "casserole dishes". America's most prominent Dutch oven manufacturer, Lodge, was founded in 1896 and is located in South Pittsburg, Tennessee.